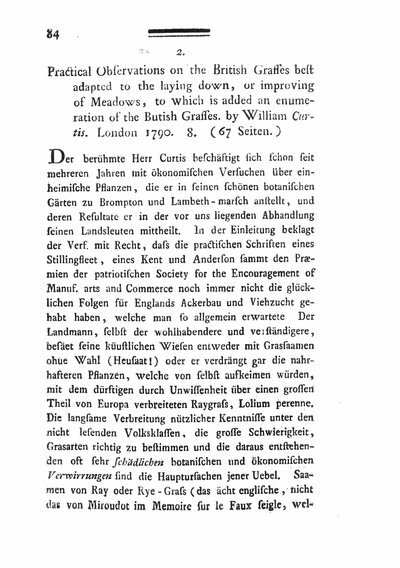 Deutsches Textarchiv – Humboldt, Alexander von: [Rezension zu:] Practical Observations on the British Grasses best adapted to the laying down, or improving of Meadows, to which is added an enumeration of the Butish Grasses. In: Annalen der Botanick, St. 1 (1791), S. 84-87. Humboldt, Alexander von: [Rezension zu:] Practical Observations on the British Grasses best adapted to the laying down, or improving of Meadows, to which is added an enumeration of the Butish Grasses. In: Annalen der Botanick, St. 1 (1791), S. 84-87. Zitationshilfe: Humboldt, Alexander von: [Rezension zu:] Practical Observations on the British Grasses best adapted to the laying down, or improving of Meadows, to which is added an enumeration of the Butish Grasses. In: Annalen der Botanick, St. 1 (1791), S. 84-87. In: Deutsches Textarchiv <http://www.deutschestextarchiv.de/humboldt_observations_1791>, abgerufen am 25.04.2019.